Recently I spent ten days in Austria, mainly participating in the tenth anniversary of Franz Jagerstatter’s official recognition as a martyr and blessed from Austria. In 1938, Hitler’s Germany invaded the first of many European countries, Austria. That event is known as the “anschlus”. Shortly afterwards, Germany started drafting Austrian men into their military. A refusal to accept the draft was punishable by decapitation. In his early years, Franz Jagerstatter was a normal fellow whose claim to local fame was that he owned the only motorcycle in his hometown of St. Radegund. He was somewhat wild, and when he met and married Franziska, his life turned in a major way. He became much less wild and quite religious. He became the sacristan at the local Catholic church in St. Radegund. Franz received his draft notice and went through a process involving Franziska, his local priest, two bishops, and numerous friends in town. In the end, he decided (with Franziska’s consent) to refuse the military draft because he firmly believed that Hitler was a very bad man and Franz’s conscience did not allow him to serve for such a man. He did this even though he was the father of three young girls and the draft refusal by one “ordinary” man was most unlikely to have an effect on humanity. After his decapitation, Franz’s refusal received no attention until Gordon Zahn (professor of sociology and founding member of Pax Christi USA) took enough interest in this conscientious objector case and wrote the 1964 book called, “In Solitary Witness”. 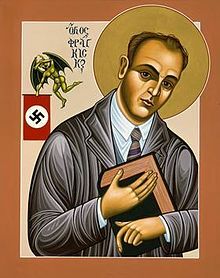 Many people read the book, and eventually the Vatican agreed with the bishops of Austria and Germany that Franz was truly a martyr and blessed. The corresponding commemoration took place in the Linz area in May of 2007. In the ten-year memory of those events, a series of activities were recently carried out in the Linz area of northern Austria, in which I gladly participated. St. Radegund is a beautiful and quiet village of about 500 residents. The country houses are widely spread out over lovely farm land; many of the houses carry out activities such as farming and raising cattle and pigs in the rear of the property. There is only one store in town, and the public part of the store has the size of a medium closet. I developed a very good relationship with the local pastor (Josef Steinkellner) during my brief stay. Over the ten days’ time, our group went on several pilgrimage walks remembering Franz and the Virgin Mary’s month of May. On one particular 8-km walk, the only participant from the American continent was asked to share some words about the Virgin Mary with the fifty participants from Europe. I said some words about love for the Virgin of Guadalupe and la Virgen de la Caridad del Cobre (from my home country of Cuba). Linz is the third largest city in Austria and the city closest to St. Radegund. It is surrounded by folks who are about 95% Catholic. It sits on the Danube river, fairly close to the German border. It is a beautiful city with numerous, very attractive churches. A coincidence worth pondering is that Hitler and Jagerstatter were both raised in this same area, and Hitler’s home and reputed grave are nearby. Linz had two adjoining concentration camps and a crematorium devoted to disposing of (predominantly) Jewish bodies. The crematorium is located below a granite quarry. The inmates were forced to move 50 kg blocks of granite (about 110 lb) downhill and uphill by hand. In the Linz area about 90,000 Jews were killed along with about 200 Catholic priests. I spent considerable time looking for Muslim centers, since my main ministry in the diocese of Oakland California is ecumenical and interfaith relations. When I finally found a mosque, it was beautiful, with a modern glass appearance, and most folks at prayer were apparently from Bosnia. One day, I was walking by a large park in Linz when I spotted about 10 individuals sitting on the grass in a rough circle. I approached the nearest fellow and we had a talk. Indeed he is a fairly recent immigrant from Congo, Africa and most of the other fellows were even more recent. He walked with me a couple of blocks, where I got to visit briefly a large old building used to care for recent immigrants. The week after returning to the U.S., I was having my first phone conversation with a peace-and-justice colleague who lives in a Catholic Worker House in rural Minnesota. When I told him about my trip, he excitedly responded when I mentioned Jagestatter. Their ranch is called Jagerstatter Ranch! So our friend Jagestatter has had an effect even in Minnesota! When Franz made his ultimate sacrifice, very, very few thought it would help humanity. And yet, many of us are better people as we learn about 1) training our conscience and 2) following our conscience. When I first communicated with Gordon Zahn regarding “conscience” (about 37 years ago), it was the first I had heard of Pax Christi. Following Gordon’s instruction, I became a leader of Pax Christi in Northern California, and am still one of the officers. I still consider myself a friend of Gordon Zahn, who passed away a couple of years ago. He was one of the founders of Pax Christi USA. I will never forget this wonderful trip and sincerely thank those who made it possible. I’ve had the honour of meeting with Frau Jaegerstaetter twice, first in 1987, when I visited her home at the end of an 8 mile walk from the Bavarian side of the river, and she gave me some rye bread and cherryade. The second was on a weekend pilgrimage in August 2003. A lady in the truest sense of the word. Everyone who ever met Franziska has treasured memories of her.